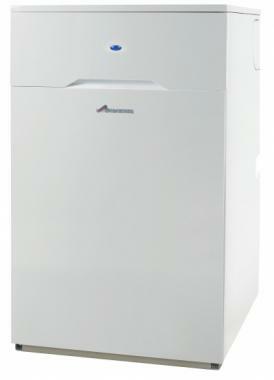 Greenstar Heatslave II External 25/32 is a floor standing combi oil boiler. It has an efficiency rating of 90% making it A rated for heat and a B rated for water. This boiler also comes with an output of 25-33kW. It has a great range of other output options such as 12-18kW, 18-25 kW, and 25-32kW making it a versatile line. It’s a perfect size if you have one or two bathrooms, with it being an external boiler it is able to be installed outside helping to free up space. The Greenstar Heatslave boasts a wide range of features such as its green powder coated cabinet to help blend it into your garden and with this it is contained in a robust casing, helping it to stay protected through any kind of weather thrown its way. The heatslave external range is compatible with a wide selection of optional features and controls that can give you greater energy efficiency and comfort. This boiler is able to work with a water heater which is used by green sources (such as solar energy and wood fired boilers) helping to increase efficiency. As well as this it is able to go into eco hot water mode for energy saving, the controls are concealed in a draw, and with it coming with inbuilt frost protection you can be sure that your boiler is protected in those cold wintery months. With this boiler comes 2 years warranty.